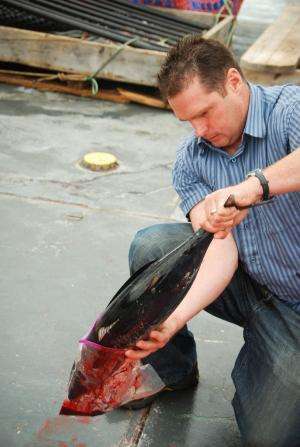 Fisheries researcher Jason Phillips bleeds a just-caught albacore tuna into a collection bag. The blood, along with all of the animal's skeletal, organ and muscle tissue, will be tested for traces of radiation. Photo by Cisco Werner, Southwest Fisheries Science Center. (Phys.org) —Albacore tuna caught off the Oregon shore after the Fukushima Daiichi power station in Japan was destroyed in a 2011 earthquake had slightly elevated levels of radioactivity but the increase has been minute, according to a newly published study. "You can't say there is absolutely zero risk because any radiation is assumed to carry at least some small risk," said Delvan Neville, a graduate research assistant in the Department of Nuclear Engineering and Radiation Health Physics at Oregon State University and lead author on the study. "But these trace levels are too small to be a realistic concern. "A year of eating albacore with these cesium traces is about the same dose of radiation as you get from spending 23 seconds in a stuffy basement from radon gas, or sleeping next to your spouse for 40 nights from the natural potassium-40 in their body," he added. "It's just not much at all." "The loins, or muscle, is what people eat and the bioaccumulation was about the same there as in the carcass," said Jason Phillips, a research associate in OSU's College of Earth, Ocean, and Atmospheric Sciences and co-author on the study. The researchers next began looking at the radionuclide levels in different aged fish and found they were somewhat higher in 4-year-old albacore than in the younger fish. This suggests that the 3-year-old albacore may have only made one trans-Pacific migration, whereas the 4-year-old fish may have migrated through the Fukushima plume twice. The majority of the 3-year-old fish had no traces of Fukushima at all. Although it is possible that additional exposures to the plume could further increase radiation levels in the albacore, it would still be at a low level, the researchers pointed out. Additionally, as albacore mature at around age 5, they stop migrating long distances and move south to subtropical waters in the Central and West Pacific – and do not return to the West Coast of the United States. "The presence of these radioactive isotopes is actually helping us in an odd way – giving us information that will allow us to estimate how albacore tuna migrate between our West Coast and Japan," Neville said. Little is known about the migration patterns of young albacore before they enter the U.S. fishery at about three years of age, Phillips said. "That's kind of surprising, considering what a valuable food source they are," Phillips said. "Fukushima provides the only known source for a specific isotope that shows up in the albacore, so it gives us an unexpected fingerprint that allows us to learn more about the migration." Yes, and there is a little bit of rat urine in everything we eat, but it doesn't mean we should put up with it.